2 bedrooms in owner's house. 1 bedroom 2/3 pers. 1 bedroom 1 pers. Price Discount from 2 nights. Extra bed child possible. With shower, toilet, private relaxation space, comfort baby equipment, garden furniture, TV, refrigerator. Breakfasts served on the terrace in summer, beds made on arrival. On site, hiking trails, tourist sites to visit. A 1 km, Aquavallée nautical center,tennis. 4km riding center. Playground nearby. Coming from Colmar, management Chatenois, Villé. A Villé to St Martin. 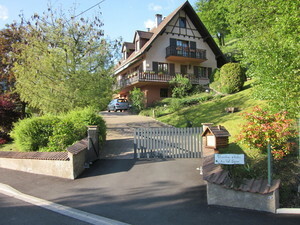 At the entrance to St Martin, at the roundabout turn right 20m guesthouse "In Val stay."